A few weeks ago I randomly bought a package of extra firm tofu at the grocery store without really having any idea of what to make with it. In fact, it's been sitting in my refrigerator all this time, and I've been doing a great job ignoring it. Yesterday I decided to make Sweet, Sticky & Spicy Tofu. The "recipe" is just something I came up with on a whim by looking at what I had on hand. If I were to do it over again, I'd definitely make a few changes. First, I would add some fresh ginger,but alas I somehow forgot to buy it at the store. And I would probably add some minced garlic. Still, the combination of Hoisin sauce, soy sauce, chives and red pepper flakes gave a lot of flavor to the otherwise plain tofu. 1. Combine Hoisin sauce with soy sauce, chives and red pepper flakes. Add cubed tofu and marinate for at least 20 minutes. 2. Heat olive oil in a non-stick pan and saute cubed tofu until it's golden on all sides. 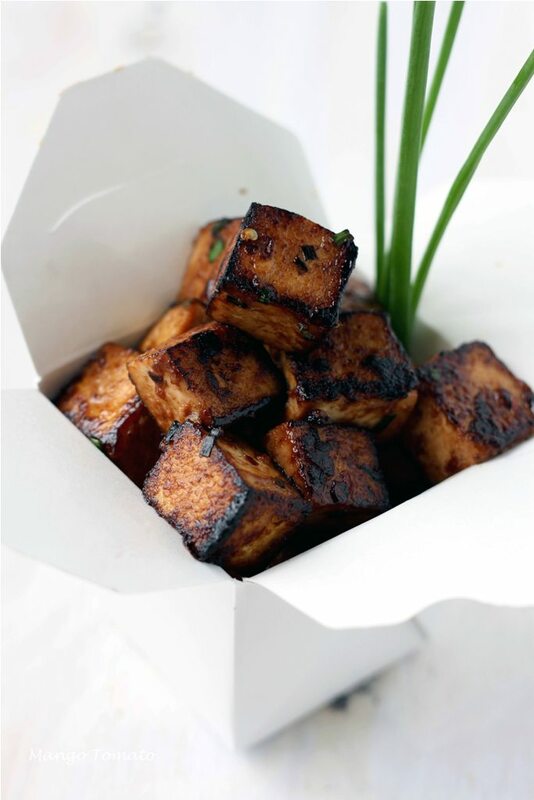 The Hoisin sauce will give the tofu it's sticky and sweet quality; while the red pepper flakes will add some spice. 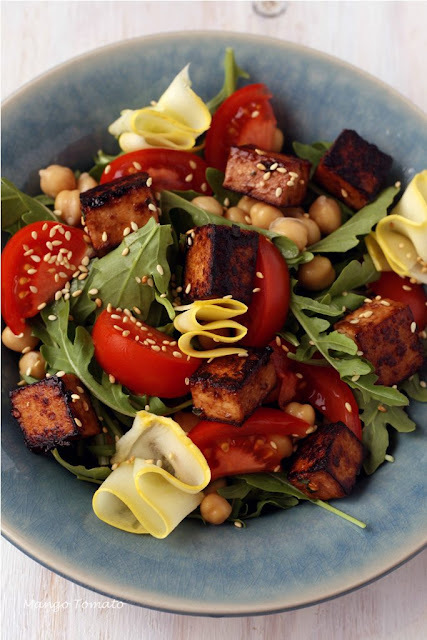 Yesterday I ate the tofu with some arugula, chickpeas, tomatoes, zucchini ribbons and sesame seeds in a salad. For the dressing I simply drizzled a bit of olive oil and a few squirts of fresh orange juice. Today, I had the tofu cold with brown rice and green peppers: perfect for Meatless Monday. The crunchy, crispy edges are the best part. They hold so much flavor. Seared or grilled tofu is great too. 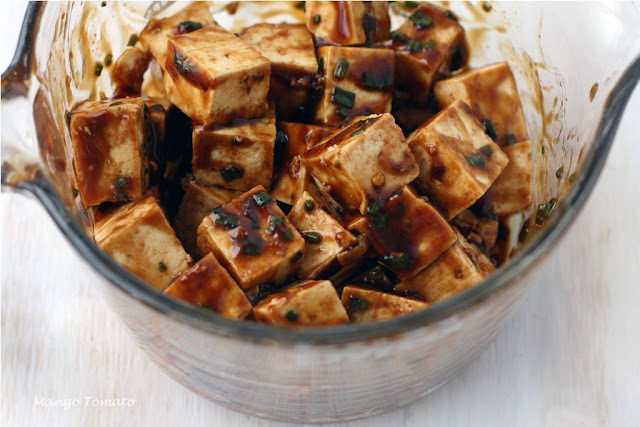 For some reason, Asian-inspired marinades are a fave way to go with tofu. Gorgeous photos as usual! 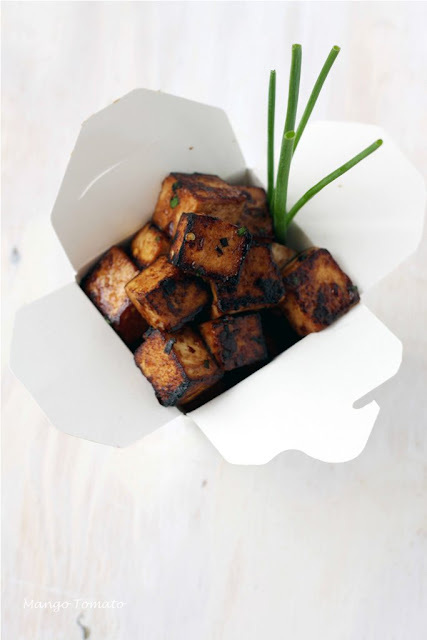 Your tofu looks so inviting... Nicely crisp... I usually have it very simply fried, so can't wait to try this! You make it look so good... I'm just not sure I will ever like tofu. Maybe you'll have to make it for me whenever we have our cooking party... you know, the next time we get together! I'm drooling. I love how the hoisin gets all caramelized... reminds me I'm all out and need to buy some more. You obviously nailed the texture on the tofu, and it looks incredible. Perfect add-in for a salad! Yum looks delish and sounds simple and easy to prepare. Fresh! 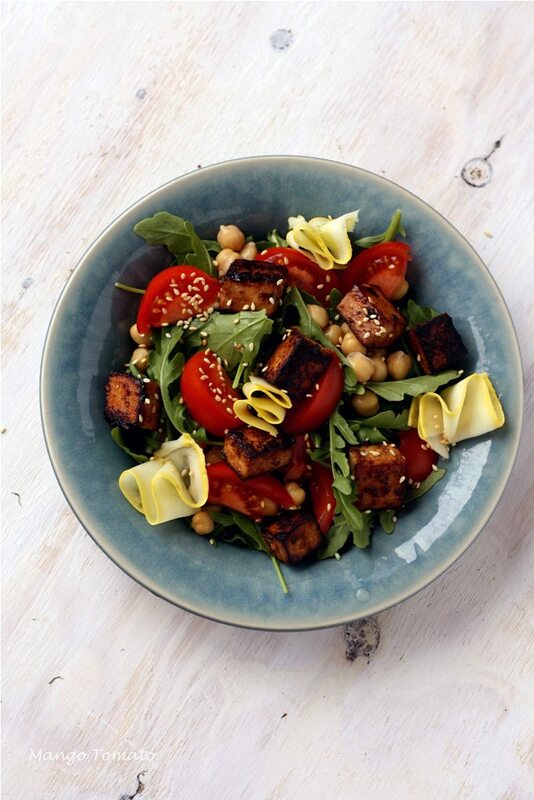 This tofu looks perfect! I usually bake it to a crisp, but I love the idea of sticky & sweet! I made this last night, and added ginger, garlic, and a little sesame oil...fantastic! This sounds wonderful! I'm definitely going to try it and since you mentioned that you would add ginger and garlic, I'm going to add some of my ginger-garlic paste (recipe on my website). I have everything but the tofu at this point so I'll pick that up tomorrow. What a great idea! Thanks for sharing. This looks absolutely mouth watering! I'm going to have to try this sometime soon! I just bought some organic tofu and this looks great! Not a tofu fan but this creation of yours looks very tempting - may have to rethink tofu! Thanks for posting. I'm so glad all of you liked the idea of this tofu and that some of you have already made it!! If you make this, please let me know how it turns out. Looks gorgeous! Why do you never invite me over for dinner again? i also picked up big box of firm tofu, this looks really delicious. Will try it for sure.Thanks for sharing. Thank you so much for letting me know you made this recipe and liked it!!! What a great idea to use the marinade for salmon: it'd be great on chicken too! I don't happen to have Hoisin sauce, nor have I ever even heard of it, hah. Is there something that I could use instead, or is it one of those irreplaceable ingredients? This recipe looks delicious! I love tofu. It's a pretty typical ingredient in Asian cuisine. You should be able to find it in an Asian section of your grocery store. If you can't, just use bbq sauce and you'll be fine!